The Turkish National Championship 2012-2013 took place on 1-9 February at the Halls of the Limra Hotel in Antalya, Turkey. The elo favorite GM Dragan Solak lived up to the expectations and won the event. The event was 11 rounds Swiss open and the Classical FIDE time control was used. A total of 320 players participated. The battle for first place was fierce and the champion was only decided in the last round. Solak and GM Alexander Ipatov arrived to the last day with 8.5 points; Solak defeated Vahap Sanal, while Ipatov wasn’t able to beat IM Atakisi Umut. 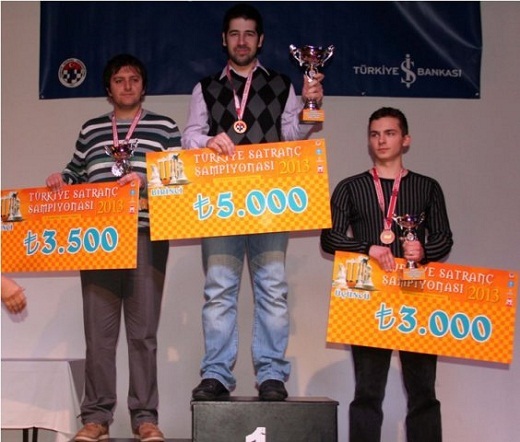 With the victory GM Solak got the title and the 5,000 Turkish Lira after scoring 9.5 points in 11 rounds. GM Baris Esen finished on second place – edging Ipatov on tie-breaks – and GM Emre Can finished fourth. Thus, the four first places were taken by the four favorite players. Full standings below.